Google for Education announced updates and new tools to help teachers keep innovation alive in their classrooms. Google Slides now features machine learning closed captions to aid in instruction, Chromebooks now features Labster Chromebook labs to help students with their assignments, Jamboard has a new View Only mode that lets teachers share jam sessions from their lessons that day while restricting edit access, updates to Docs made adding MLA citations a smoother process, and more. Edsby announced that it has built sophisticated data aggregation and analysis capabilities that allow states, provinces and countries to optimize their education investments and policies. This K-12 ‘data switch’ uses proprietary and open standards to talk to a wide variety of data sources, and merges data into a single store to provide a unified view of educational data - such as achievement, attendance and students at risk - in real time. Faria Education Group Limited has acquired Rubicon. Combined, Faria and Rubicon will serve over 10,000 schools in 130 countries with curriculum support for over 600 academic standards. Faria will deliver a new and improved version of Atlas, combining its curriculum planning functions with ManageBac’s learning management functions including assessment and reporting, service learning, and project-based learning. Faria will continue to support schools on the Atlas platform with no changes to the service, its pricing, or customer support, or the planned feature improvements. FreshGrade announced its Professional Learning Center. Designed to give teachers flexibility with their professional development (PD), the Center offers online webinars, modular courses, and customizable PD options to streamline educators’ FreshGrade’s practice. The resources in the Professional Learning Center can be accessed at any time on any device and feature a mass-enrollment option for easy implementation for principals and teachers. The webinars are led by teachers and come pre-recorded and live on the Center. Follett has released Destiny 16.0, a new version of the market-leading solution featuring significant enhancements to Destiny Library Manager, Destiny Discover, Destiny Resource Manager, and Destiny Analytics. Highlights include new reader functionality in Destiny Library Manager, offline access on Chromebooks and support for exporting eBook notes to Google Drive or Microsoft One Drive documents, web accessibility guidelines update to Destiny Discover, QoL updates to the Lexile Reading Program Service and Resource Manager, and more. Istation recently announced a partnership with Boulder Learning, Inc., to develop its Oral Reading Fluency and Listening Comprehension Program using Boulder Learning’s speech recognition technology. The new Istation program utilizes Boulder Learning’s FLORA (fluent oral reaching assessment) speech-recognition and assessment product to analyze what students say and how fluently they speak. The program’s goal is providing teachers with a time-saving tool that allows them to focus on teaching instead of student assessments. Nearpod announced an initiative to provide premium access to content to members of the International Society for Technology in Education (ISTE). The partnership will expand access to webinars, articles, and other resources designed to support teachers on how to best use technology for learning and teaching. 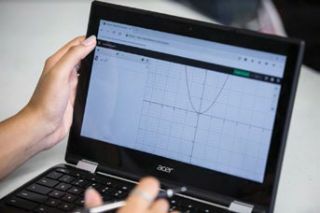 The initiative will also connect ISTE and Nearpod members with edtech experts through learning networks that offer topic-focused learning opportunities and online discussions to keep teachers updated on classroom technologies. MIDAS (Massively Integrated Data Analytics System) is a single data model application that encompasses all of the common functions for instruction in one system with one User Interface. MIDAS announced its new website has added the Education Data Visualization and Educator Growth and Mentoring tools. The revamped website also better illustrates and explains the functionality of the product, including a new products tab that more clearly shows the scope of the MIDAS Education Enterprise System. QwertyTown 2.0 is a web-based keyboarding app that teaches typing, digital literacy, and online communication skills. Students are driven to succeed by QwertyTown’s gamification features, social motivation and engaging lessons and challenges. Teachers and administrators are empowered with tools that meet the needs of everyone for any sized school. QwertyTown is One Roster compatible and has partnered with Clever to offer Auto Sync, Google SSO, sign-in with badges, Chromebook auto login and more. Lea(R)n and Project Unicorn announced the launch of the Project Unicorn Product Library powered by LearnPlatform, a hub for schools and districts to discover interoperable education technology tools. The partnership will advance their shared mission to increase equitable access to high-quality learning technologies, including through enhanced interoperability, student data privacy, and security. The hub allows for comprehensive edtech management, informed decision making and increased transparency in purchasing for schools and districts. Possip is a new digital tool that empowers parents to communicate constructive feedback to schools via text messages. Features include automated feedback prompts, mini-surveys that take less than a minute to complete, weekly reports that cover trends and highlights relevant to a given school, and it provides support for multiple languages, allowing every parent to have a voice. Possip provides a community that lets parents have a direct role in improving their schools. Pearson VUE has entered into an agreement with Splunk Inc. to provide Splunk certification candidates access to its network of thousands of highly secure test centers in 180 countries worldwide. The exam titles include: Splunk Core Certified User, Splunk Core Certified Power User, Splunk Enterprise Certified Admin, Splunk Certified Developer, Splunk Enterprise Certified Architect, Splunk Enterprise Security Certified Admin, and Splunk IT Service Intelligence Certified Admin. Studytracks launched into the U.S. education market and is available through Google Play and the App Store with a free trial available through their website. Using the “Earworm Effect,” Studytracks takes curriculum and puts it to music to drive engagement, retention and achievement anywhere. Students can listen to tracks and take tests on their own schedule while educators can create their own playlists and tests within the platform and monitor their students’ progress. TechPilot Labs is releasing the Parent Portal add-on for their Apple MDM and Chromebook classroom management system. Parent Portal allows parents to manage their child’s Apple device or Chromebook during non-school hours as configured by the school or district. Parents can disable browsing during curfew hours, restrict browsing to a single website needed to complete assignments, and more. Parent Portal is a free add-on available to all districts utilizing TechPilot’s SchoolMDM or ChromeTools management platform. Benchmark Education Company (BEC) introduced Texas Benchmark Workshop and Benchmark Taller in Texas—combined print and digital resources for grades K to 5 in English and Spanish for reading, phonics and word study, and writing. These workshop modules offers efficiency, flexibility, and choice to Texas teachers. Additionally, Grades K-5 are connected through ten vertically-aligned knowledge strands focused on literary, science, social studies, and genre to build content-area concepts and vocabulary, providing a comprehensive solution for biliteracy. Vivi announced its entry into the U.S. edtech market. Designed with the collaboration of educators, Vivi’s classroom management solution system sets teachers free to roam the classroom and interact with students, allowing for immediate teacher and peer feedback. In addition to its core functionality of screen mirroring and video streaming, Vivi brings a slew of additional educational features under the control of a single, easy-to-use app and institutional management through an admin portal. Waterford Institute announced that it has been awarded an Education Innovation and Research (EIR) Expansion Grant from the United States Department of Education’s Office of Innovation and Improvement. Totaling $14.2 million, the five-year grant will enable the Waterford Institute to launch Waterford UPSTART pilot programs in Wyoming, North Dakota, South Dakota, Idaho, and Montana, affording children in each of these states complimentary access to the leading kindergarten readiness program. Acer (edu.pa@acer.com) made available its Acer Repair Certification eLearning Program to education accounts in the United States and Canada, giving high school students the opportunity to build transferable skills in a hands-on setting. Students interact with eLearning modules including videos, resource materials and assessments, then must demonstrate their technical skills for a local school staff member by replacing either the mainboard or the LCD screen of an Acer C738T Chromebook, a product qualified for the program. Seville Classics (www.sevilleclassics.com) announced the expansion of its AIRLIFT line of sit-to-stand desks. The AIRLIFT S3 Electric Standing Desks feature a three-section frame that rises from 24.8 inches to a maximum height of 51.4 inches. Additionally, the desks include dual motors that lift up to 264 lbs. at a brisk 1.49 inches per second. The desks also feature a curved desk top (54” x 30”) available in a black, white, or walnut finish.